In the early days of the Star Wars Expanded Universe, now branded Legends, one name became synonymous with Star Wars comics: Tom Veitch. Tom, along with artist Cam Kennedy, relaunched Star Wars comics in December 1991 with the release of Dark Empire #1. 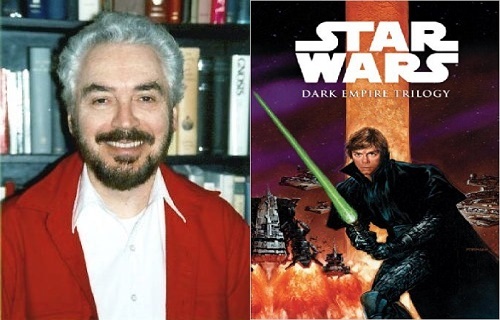 Veitch would go on to write five more issues of Dark Empire, as well as two sequel series (Dark Empire II and Empire's End). He also launched the Tales of the Jedi comic book series, which took fans back thousands of years before the films and showed some of the earliest adventures of the Jedi Order. Though he hasn't written for Star Wars in many years, Tom remains an icon among Star Wars comics fans. His stories laid the groundwork for what would become the old expanded universe, and some of his concepts still find their way into the current canon. He was recently interviewed by our friends over at the Spanish Star Wars fansite Las Fosa Del Rancor. The interview was originally published in Spanish, but they have kindly allowed us to publish it in English. Enjoy! First of all, how did the idea for Dark Empire come about? TOM: Cam Kennedy and I got the idea of sending our Marvel/Epic Comics series THE LIGHT AND DARKNESS WAR to George Lucas and proposing a new fully painted Star Wars graphic novel. George loved the idea and asked me to send him plot ideas. My first idea, believe it or not, was to do a series called "The Jedi Chronicles" which would delve into the history of the Jedi Knights. He said he preferred that we take off from the ending of Return of the Jedi and tell the fate of Luke, Leia, Han, et al. So I put together the concepts that led to Dark Empire. Now, it should be noted that we had feedback from Mr. Lucas on the plotting of Dark Empire. And our editor, Archie Goodwin, also had a hand in the plotting. He was "Mr. Star Wars" to us, having written many great Star Wars comics for Marvel, as well as the newspaper Star Wars comic strip with artist Al Williamson. And of course the other significant creative element was Cam's sketches. He would come up with visual idea — machines, weapons, characters — and I would work them into the story. At the time, there was a lot of interest in how your work fit with The Thrawn trilogy of novels. Did you talk with Timothy Zahn to organize yourselves and put the whole story together? So HEIR TO THE EMPIRE came out, was an instant best-seller, and LucasArts said to me, "See if you can make the comics fit with Heir to the Empire." I rewrote the introductory rollup to make them fit together. Later, when creating Dark Empire II, we took Zahn's work more fully into our plotting. Another interesting fact, generally unknown by the fans, is that Tim was asked to critique the DARK EMPIRE plot and I was asked to critique his book. This led to a spirited exchange which someday may see print. Tim hated the idea of Emperor coming back (and probably wasn't aware that George Lucas had proposed the idea to us). As for me, I found his book curiously uncinematic. I felt (and still feel) that all Star Wars novels need to be highly visual and give you the impression you might be sitting in a theater. I told him Heir to the Empire didn't feel at all like watching a movie. Tim took that criticism to heart and his subsequent work was a definite improvement. How did you come up with the idea of bringing back the Emperor? TOM: Our original proposal was to bring back Darth Vader's costume and mask, with somebody else inside it. We felt the Empire would want to maintain the fearsome image of Vader and wouldn't much care who was wearing the armor and breathing mask. George vetoed that idea (although he did allow us to have Vader appear in dreams and memories). He said, no, you can't bring back the Vader costume...but if you can figure out how to bring back the Emperor, that's o.k. The obvious way to bring back the Emperor was with cloning, which George immediately approved. Now, Zahn has said in an interview that bringing back the Emperor goes against the story of Return of the Jedi, where we see the Emperor destroyed by Darth Vader. But Zahn misses something essential about that scene: When the Emperor dares Luke to "strike me down", he seems utterly indifferent to his own death! He feels that whatever the outcome of this confrontation with Luke, he, Palpatine, will conquer. It was my thesis that the Emperor chose this moment to come out of his deep seclusion in the Imperial City, because he no longer feared for the safety of his physical body. His mastery of the dark side had become such that he was now ready to make a transition he had been working toward for many years — namely the replacement of his aging, diseased, and crippled body with a young clone! Tempting Luke to strike him in anger with a lightsaber could thus accomplish two things: It would bring Luke over to the dark side...and it would mark the moment when Palpatine made the transition to his clone body. Luke, as we know, resisted the temptation to kill the Emperor. But then Vader hurled the Emperor down the deep shaft, and we saw a series of blue flashes marking the Emperor's demise. The blue flashes represented the Emperor's living energy, his conscious dark force, leaving his body. And according to our story, his consciousness was translated across the Galaxy almost instantaneously and entered a new youthful body. Using cloned bodies Palpatine could live forever...and perhaps rule the Empire for thousands of years! About Luke’s fall to the dark side, were you looking for a parallel with the decisions of his father (Vader)? Did Lucasfilm somehow tell you something about how the Emperor seduced Anakin Skywalker to the dark side to capture this later in the “Dark Empire” storyline? TOM: To tell the story of Luke journeying into the dark side was my idea. But it was inevitable from the films, and had been discussed for years. Consider whose son he is! In fact, as you may know, Mark Hamill has said he proposed it to George back in the mid-1980s. In order to really conquer the dark side, you must go into it and understand it from within. You have to risk being taken over by it. And maybe you will be possessed by the dark side, at least for awhile, But in the end, with the power of the lightside of the Force, you will conquer it. About the return of Boba Fett...even George Lucas said that killing him in Return of the Jedi was a mistake. Did you always have it in mind to bring him back? What background did you imagine for the character? TOM: There were no problems bringing Fett out of retirement. He was one of the most popular characters and, as you say, George always regretted killing him off. So it was simply a question of saying he was "too indigestible" for the Sarlacc. That's something of a joke, of course. But it was very easy to imagine, especially considering his weaponry and Mandalorian rocket pack. At one point I did write a background for Fett which is somewhere in my archives. Dark Empire showed an important part of Han Solo's past with partners like Shug Ninx, Salla Zend or Mako Spince, and places of his former smuggler's life. Those elements were developed in the trilogy written by A. C. Crispin. What inspired you to create the past of Han? Was there any idea about Han's past that you would liked to include or develop more deeply in Dark Empire? TOM: Han's past grew out of the creation of Nar Shaddaa, the "smuggler's moon" with its planet-embracing city and criminal underground. We just riffed on Han, letting imagination rule the day, based on that environment and situation. I knew Han should remain mostly a mysterious character, so I didn't go into great detail as to his past. (Didn't he wash out of the Academy?) As with all the best Star Wars characters, it is the viewer (or reader) who fills in the blanks with his or her own imagination. That, in fact, is one of the "secrets of Star Wars". By the way, Han Solo is the most fully realized character in Star Wars, largely thanks to the work of Harrison Ford, who filled out the character with his own personality and superior acting abiltity. One of the concepts that we liked most in Dark Empire was the great Mandalorian ship that was used to transport Jedi prisoners during the Clone Wars. Did you received any guideline from Lucasfilm about this? TOM: That ship was our idea. We received hardly any "guidelines" in those days. In fact, George gave us "carte blanche" (his words) to dream up ideas. But he wanted to see and approve almost everything we came up with. Fortunately he seemed to love what we were doing, disapproving very little and offering good suggestions for improvement. The World Devastators innovated and re-introduced the concept of super-weapons in Star Wars. Then came the Galaxy Gun in Dark Empire II and Empire's End. Is it Palpatine’s lack of confidence in the power of the dark side even though he is able to create his powerful Force Storms? Or perhaps is it an unhealthy obsession with demonstrating the military might of his regime? TOM: The super-weapons are there for visual and cinematic reasons...and to give Cam a chance to show his stuff. Also, they answer the question, "What would the Empire build after the Death Star?” The idea of a "galaxy gun" was something that seemed inevitable to me, considering the reality of hyperspace. I was pleased they picked it up for THE FORCE AWAKENS, although they fumbled the concept in a major way, imho. Note on "Force Storms": The Emperor can't create Force Storms at will. They are in fact a phenomenon that occurs rarely, when the minds of two great Force users meet and struggle with each other at a distance. Why did you decide to create Anakin Solo? Did Lucasfilm tell you to give a little brother to Jacen and Jaina? TOM: From the beginning we wanted Han and Leia to be married...so a child was inevitable. It was something of surprise that Tim Zahn had already given them two kids by the time we made Leia pregnant with Anakin. So suddenly there were three Solo children, and as we know from the novels, they went on to fame and fate in various ways. About Jem Ysannia, the apprentice and girlfriend of Luke, did their romance have a chance to go beyond Dark Empire II? TOM: In my mind it did. And in my notebooks. TOM: I can tell you the book was written and well-received by LucasArts. George read it and approved it. But due to the stodgy side of the business, we never received a contract! When George found out that he had approved the book without a contract, he killed the project. There was a tremendous uproar at that point and the axe fell in a number of ways. One of the major consequences was that a proposed third series of Dark Empire was cancelled, Cam resigned, and I was told to wind up the whole plot-line in the two-issue series that Jim Baikie drew. It was a sad day, but it shows you how the business side can hurt the creative side, even on a popular project. The legal beagles were slow to get out the contracts, and "1000’s of Bothans died", so to speak. About Dark Empire’s appendices, why wasn't something similar included in Dark Empire II and Empire's End? It was a great resource that helped readers a lot to immerse and put ourselves in the story and expand the Star Wars universe adding all sorts of new elements. The art of Cam Kennedy gave a good dark touch to the Dark Empire and Dark Empire II series... why did he not return for Empire's End? TOM: See my above answers. Cam, being one of the best, has always had lots of options for work. So when the "people in charge" make problems, he just changes jobs! What was the difference between working with Cam Kennedy and Jim Baikie? TOM: I knew Jim Baikie from meeting him in Scotland. He lives (or lived) just down the road from Cam. A very sweet man with a marvelously creative wife. We worked together in the traditional way of doing comics — I wrote the script, it was approved, and Jim drew it. Cam and I had a much more interactive collaboration, with many hours of telephone conversations across the ocean. Did you always have in mind that Han Solo was the one to kill the Emperor Palpatine definitely? TOM: No. That’s just the way it worked out. Looking over it now, it’s a great scene, and Baikie did an excellent job on it. Indeed, looking over Empire’s End I am getting a fresh appreciation of what a great artist he is. You created the planet Korriban as the origin planet of the Sith. This element has been remained untouched even in the new canon (despite the name being changed to Moraband). What went into developing this background of the Sith? Would you have liked you to explore and develop it a little bit more in the comics? TOM: As I recall, the name "Korriban" came from Kevin Anderson. He was another great guy to work with. Our idea sessions in California were a blast. We got permission to explore the ancient Sith, and went all out on it using our imaginations. You know, the possiblities in a time period 4000 years before the films are virtually infinite. Thanks to our mental symbiosis and the visual powers of Chris Gossett, we were able to do a great job. Special mention should also go to Janine Johnston, David Roach, and Tony Atkins for magnificently visualizing the ancient Jedi and their worlds. In Dark Empire’s appendixes, part of the history of Ulic Qel Droma and Nomi Sunrider was told. It also showed the relationship of certain characters like Vodo Baas and Vima Da Boda with the Tales of the Jedi saga, which helped to give more cohesion to the Star Wars universe over those years. Had you already thought ahead about telling this story in comics? TOM: The TALES OF THE JEDI series was under development while I was working on DARK EMPIRE, so it was easy to build inner connections. As a matter of fact, I proposed Tales of the Jedi to LucasArts right after the first issue of Dark Empire came out. The lady at LucasArts said "George will never go for this." But he loved it and once again gave us carte blanche. Any ideas from the Dark Empire trilogy remaining in the pipeline? TOM: That's an interesting question. I have notebooks packed with ideas, most that nobody has seen. I will be discussing some of them in my new book. But I won't be writing Star Wars comics again. Planets and locations created by you are part of the new canon and others transcended the books, being spotted in other media (like video games or TV series): Nar Sahddaa, Nal Hutta, Onderon, Vjun ... even Star Wars Rebels’ Inquisitors remind us of Imperial Executors from Dark Empire II. What do you think about the distinction between the old Expanded Universe (now Legends) and the new Disney’s canon? TOM: I have seen the Disney cartoons on television, and of course I have seen The Force Awakens a couple times. The main distinction is that a new generation of writers and artists and film-makers are now involved. I don't think what they are doing is "better" than the E.U. — just different. I am glad when they use things we created, though. I loved that the Holocron survived the comics. What other Star Wars era would you liked to write? On other jobs ... You and Martha Veitch, were the first to create the background of Greedo in a story from the novel Tales from Mos Eisley Cantina. What did you base it on to create the story? What ideas did you have to discard for the Rodian's tale? What did you think when Episode I gave him a totally different background? TOM: I wrote that story and my wife Martha helped on the idea sessions and the editorial polish. I have no idea what ideas we didn't use. But they are in a notebook somewhere. Along with Kevin J. Anderson, you created another of the most influential works of the Star Wars universe: Tales of the Jedi. He co-wrote the "Dark Lords of the Sith" arc… Did you know he was going to continue the series next to you (maybe for a sweeter transition and help continuing what you previously did), or did you think it would be a timely collaboration? TOM: See above. As you know, there came a point in the mid-1990s when I dropped out of doing Star Wars. Kevin wanted to continue, as did Chris Gossett. One of the coolest Star Wars concepts was a Dark Jedi with a double lightsaber for the first time in your Tales of the Jedi series (Exar Kun rules, by the way). How did you come with that idea and what did you think when you saw Darth Maul with it in Episode I? ...Isn't it true that part of the power of Star Wars is its imagination and how the viewer feels like it is coming out of their own subconscious mind? Lucas, you see, tapped into what C.G. Jung called "the Collective Unconscious"...a huge part of the psyche that belongs to everyone and no one. If you ask me, George kind of forgot that when he did the prequels. He had lost his edge and probably should have hired other writers, or handed the story off to the fans, like Star Trek did. The way in which we see the Jedi in Tales of the Jedi, including their organization, is a little further back than what we have seen in the prequels. We don't know if George Lucas, in those years, actually had a plan for what the Jedi order should be. How much freedom did you have when you created the Jedi Order organization during the Old Republic? Did Lucas give you any guidelines to be followed? TOM: We had total freedom. But, as you know, he had too see lists of our ideas and plans, and give approval for each thing. So he was definitely involved in the genesis of the ancient Jedi order. That said, I think George has always felt that the comics were an “alternate Star Wars universe” from the films. I don’t think he ever saw the comics as canon — although he did use them as a resource for ideas and images. Other products like the Knights of the Old Republic video games continued this era that you started with those comics. Did the developers ask you for any advice or assistance during the creation of their story? In fact, your characters are mentioned on several occasions (Ulic Qel Droma, Nomi Sunrider, Exar Kun…). Following that question… Did you think that your work would inspire so many other people in future Star Wars projects? TOM: Yes. The whole idea, from the beginning, was to free up the creative side of the franchise. We asked Lucasfilm (and LucasArts) to allow the writers and artists who loved Star Wars to follow inspiration and imagination. Back in the 1980s when Marvel was doing the comics, there was a very complicated approval process. They made it very difficult to do anything really interesting. From day one, Cam and I said we couldn't work that way — we needed to unleash our Star Wars imaginations. And since at the time no more films were planned, the powers-that-be said "O.k., go for it!" The end result was the torrent of creativity that came out of Dark Horse, and in the paperback novels and games. A question that we have had for years and whose answer we have been unable to find on the Internet: In the latest issue of Dark Lords of the Sith (specifically the scene in which the Ancient Sith proclaims Exar Kun and Ulic Qel Droma as heirs of the Sith legacy) the last page has a different picture from the TPB version. Do you know why this was so? Why are there two pages of the same series drawn different in the sixth issue and other in the TPB format? TOM: I am afraid I don't know the answer to that. But I will put it on my list of things to look into. It might be that the original artwork was lost and had to be redone. Have you followed the evolution of the expanded universe of Star Wars (both Legends and canon)? TOM: I didn't follow it closely. But a friend of mine, Mike Beidler, read EVERYTHING. And he made a descriptive timeline that I studied. And finally, have you seen The Force Awakens? What did you think? TOM: Yes, of course. In general an extremely well-made movie, thanks to J.J. Abrams and his team. But I have to agree with the criticism that it was a remake of A New Hope. I would also say it lacked the "oh wow" factor of the original films — you know, where suddenly you are seeing something that you never dreamed was possible. Everything in TFA speaks of nostalgia, and retelling the story for a new generation. It was probably "safer" to do that, from a business point of view. But on the other hand, if you don't take chances, where's the fun? If you have seen Abrams’ "Super 8" and other movies, you know he has a much superior Star Wars story still hidden away somewhere in the back of his brain. Read the interview in Spanish here. Err... no, I'm pretty sure it was a better idea for Luke to not go to the Dark Side and Palpatine getting cloned. Makes the whole Saga feel a bit irrelevant. You guys did a great job with this interview. If you ever interview Tom Veitch again, or have the opportunity to ask him a question, could you clear up the naming controversy with Nomi Sunrider? Fantastic interview! Whipping out my copies of Dark Empire now and dipping back into those stories! I know what project *I'd* like to see...a redone comics adaptation of the Thrawn Trilogy with much better artwork. I would still rather read that trilogy over again than Dark Empire or any ideas from the same well. I kind of laugh at the notion HTTE wasn't "cinematic" enough compared to...undead Emperor, lather rinse repeat? As wacky as Dark Empire was, it makes more sense than what's happening in Disney canon now.